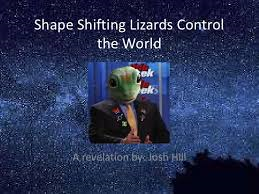 In the past, lizards have been content to control the world on a top-down basis, infiltrating the United Nations, the Freemasons and senior management of Starbucks, but many are starting to question that approach after learning of the dismal 4% number. “We really haven’t gotten out into the communities where we live,” says Mike Axzliia, who lists himself as an “independent” lizard but who leans towards shape-shifting mud lizard positions on major policy issues, including his personal environmental “hot button,” the wide-spread use of insecticides by humans that keeps lizards’ food costs high. “We should be running for school board, town council, those humble offices that touch humans’ lives directly, so we can make a difference,” he says. But lizard leaders agree it will take a lot of effort on the part of volunteers in “retail” politics to bring about change, a fact that doesn’t seem to darken Jim Glzorp’s mood as he watches his son return followed by a human child, 8-year-old Jimmy Cagnetta, whom he met inside the mall. Get-out-the-vote efforts would be much easier if they didn't live under rocks.